Arlington EB0708 - Electronic Equipment Enclosure Box, 7" x 8" x 3.5", Non-Metallic, 1-Pack. 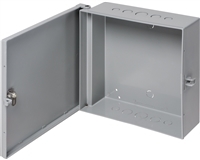 Non-metallic enclosure boxes - for protecting and securing power backups and security devices in a debris-free environment. Made of heavy-duty, UV-rated non-metallic material, dimensions: 7" x 8" x 3.5". Enclosure boxes are lockable with a latch that accommodates a padlock. 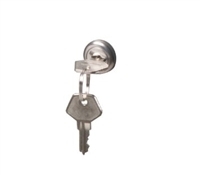 The enclosure lets you install an optional key-lock - the front door has a knockout that fits cam-lock(model: EBL1). handy 1/2-inch and 3/4-inch knockouts on top and bottom of enclosure box. Heavy-Duty, Non-metallic, protect devices, backups, and more.